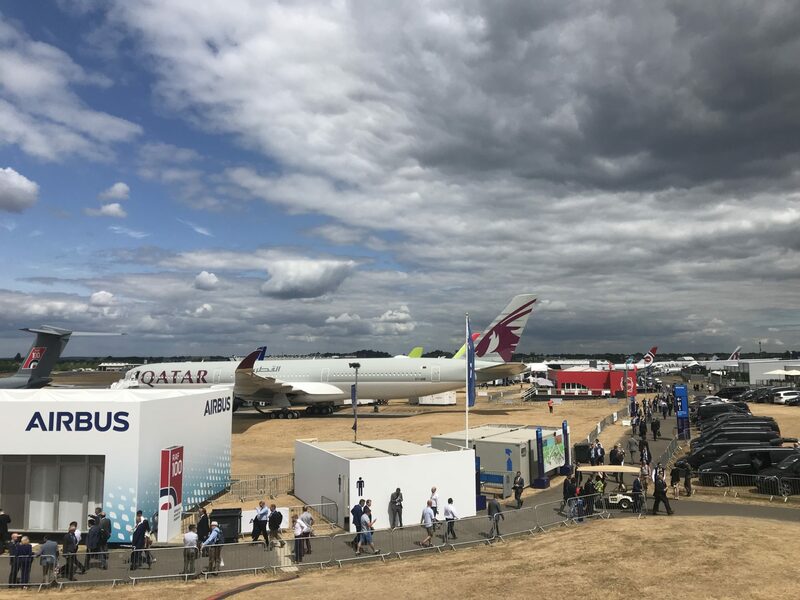 At 9am on Tuesday the 17th July, the second day of trading, exhibitions and seemingly implausible aeronautical acrobatics commenced at the Farnborough International Airshow – the acclaimed biennial event for the global aerospace industry. For us at Eskenzi PR, the day started – and ended – with haste and excitement (and a little logistical confusion). 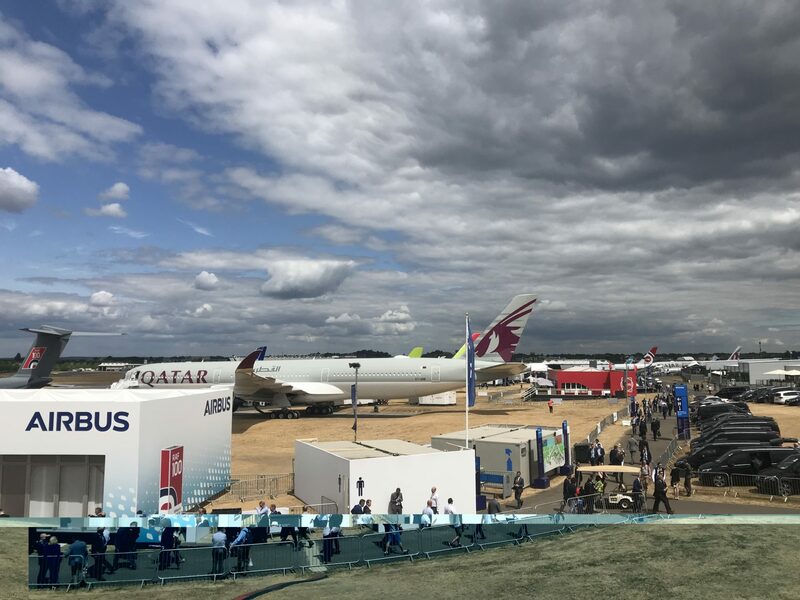 After navigating the vast network of airliners, pavilions and helipads that were sprawled across Farnborough’s impressive airfield, we arrived at the Airbus Cybersecurity chalet. 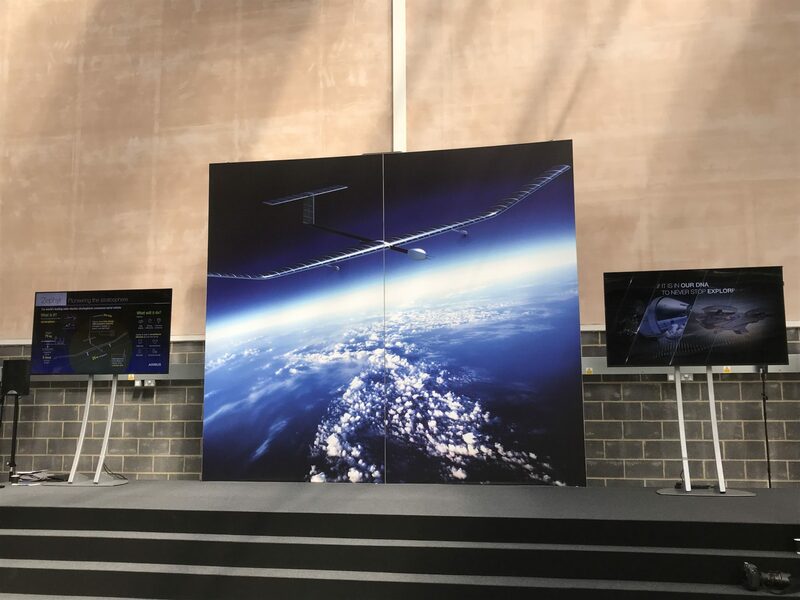 Within an hour the journalists, from a variety of tech publications, had joined us, armed with their cameras and notepads ready to probe and learn about Zephyr – Airbus’ stratospheric UAV – and its most recent ground-breaking feats and developments. At 10am we were driven a short distance to the Kelleher building to admire it in the form of a replica model. With a 25- metre wingspan and an impossibly insubstantial weight of 75kg, it is a truly remarkable piece of aeronautical engineering. The only problem was that these diameters were as difficult to photograph on a bog-standard iPhone camera as they are remarkable… It did however, prove to be a great backdrop for several interviews that took place between journalists and Airbus colleagues. The mornings fun continued when we were given the chance to explore a number of Airbus’ new aircraft through virtual and augmented reality demonstrations. These immersive experiences gave us a better insight into how the different planes will look, function and fly in an informative and up-to-date fashion that was typical of the Airbus brand. After immersing ourselves in some quintessentially tasty French cuisine back at Airbus HQ, we were able to watch some real planes in action. However, not before each journalist was able to quiz Ian Goslin – Managing Director and Head of UK Cyber at Airbus – on the company’s strategic approach to cybersecurity, current threats to the aviation industry and his perspective on the contemporary cybersecurity landscape. Crowded around a few small tables, each journalist asked for, and then absorbed, his expert insights and infectious passion for his employer and the wider cybersecurity industry. 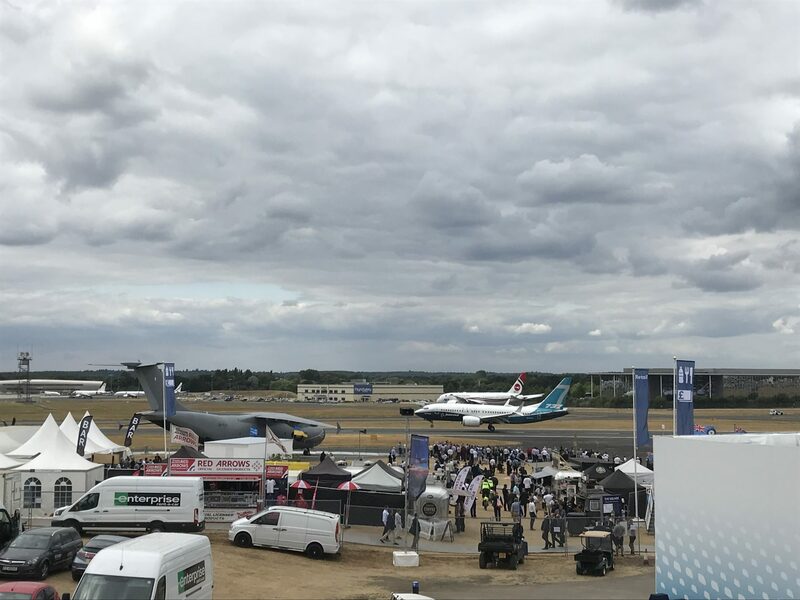 When the last interview was over we were all invited onto the chalet terrace where we watched one of Farnborough’s renowned live air shows. Watching an array of colossal planes, ranging from passenger aircraft to military fighter jets, performing the most agile aero-acrobatics proved to be a suitably breath-taking end to a productive, enlightening yet hectic day of interviews and virtual exhibitions. I remember attending Farnborough Airshow, the UK’s longest running dedicated aviation show, in 2006 when Airbus first demonstrated the double-decker a380. An impressive piece of engineering that has advanced commercial air travel. Funny then that 12 years on, I would be attending the show once again as a PR and Marketing representative for Airbus Cybersecurity. James has already explained the day’s events and I must say a huge thank you to Airbus for its hospitality. Airbus put on a great show for us and journalists from BBC Click, ZDNet, Tech Republic, Computer Weekly, IDG Connect, SC Magazine and The Register, who all came away from the day with interesting content for their respective publications. 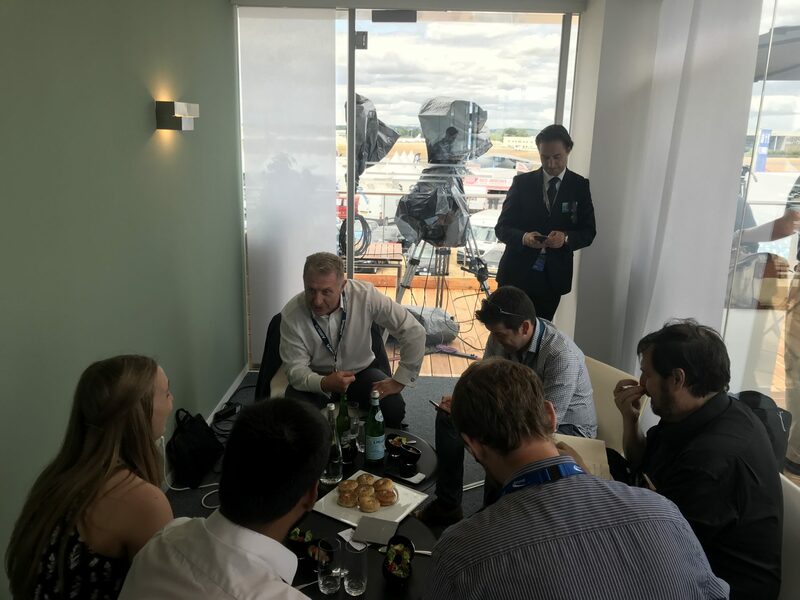 Representing Airbus Cybersecurity was Ian Goslin, Managing Director and Head of UK Cyber, who sat down with the journalists to give them insight into what Airbus Cybersecurity was about, the threats posed to the aviation industry and his thoughts on cyber overall. Ian started with a brief introduction to the company and his military background before delving into the juicier content that really perked the journalist’s ears. Pages upon pages were being eaten up as journalists tried to scribble every morsel of information down in their notebooks. Issues and insights ranged from current critical national infrastructures, to the evolution and maturity of the cyber industry today, to how Airbus’ platform continuously operates to offer protection against the unrelenting threat of attack. Ian then spoke about the general threats found in the aviation industry which, he states, are growing and that threat actors are increasing their powers to intently do something negative. This has resulted in Airbus Cybersecurity having to defend clients on a constant and continuous basis. He also claimed that there is a distinct divide between airports and their security with some operating at a good standard and those that are not. Unsurprising to hear, following recent research that found airports are generally ill-equipped to deal with major cyber attacks. Scary right? However, Ian gave us all reason to feel optimistic over the situation and claimed that the formation of the National Cyber Security Centre was a great step forward in giving organisations the help they needed in remediating both the known and unknown cyber threats, especially in the UK. Other than feeling glad the day went well for both client and journalists, we left Farnborough with a sense of reassurance that organisations like Airbus CyberSecurity are in the background defending critical systems that we might otherwise take for granted as being secure.